Alongside the horizontal green roof, in recent years the vertical axis, aka green walls have been becoming more popular across the developed world. 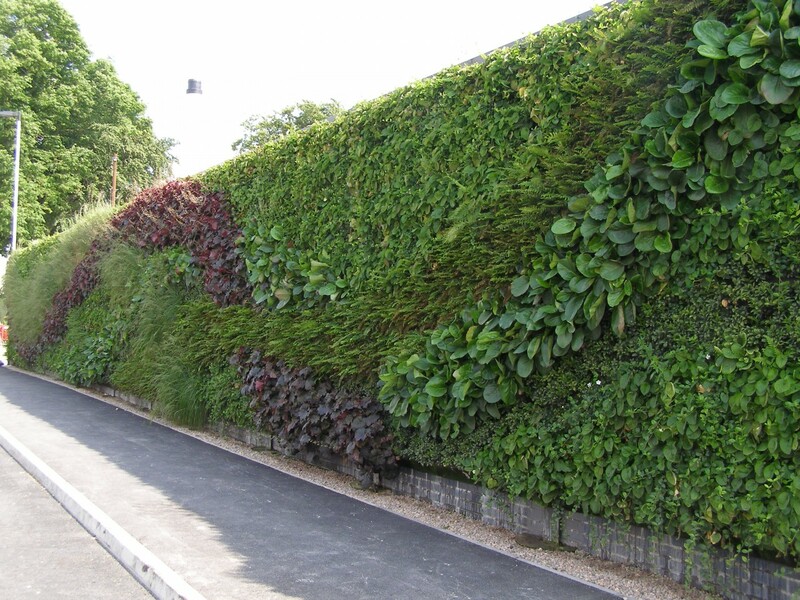 They are as described, walls covered by vegetation with an earth or soil component for plants to grow in, generally, though not always, with a water system integrated into the wall. Examples from around the world show how green walls can be found at all scales, from the small fence wall to the very large, growing on the side of corporate buildings. Green walls are a popular alternative in cities where parks, and other green spaces are not available. They serve a variety of functions, including reducing heat in cities and the urban fabric; reducing rain water or grey water run-off, since plants help to purify water; urban gardening, and also, of course, as literal gardens, tended for the same gardenly reasons as their horizontal cousins. Another well-known vertical garden by Patrick Blanc is the Caixa Forum museum and cultural centre in Madrid by Tate Modern’s Swiss architects, HerzogdeMeuron. One of the most famous (and iconic) green walls grows on the roadside face of the Musee du quai Branly, in Paris. Completed in 2005, the 40 feet tall by 650 foot long vertical garden highlights the work of its creator, Patrick Blanc. Designed as a living tapestry to reflect the diversity of world cultures housed by the museum, the eye catching green wall, just next to the Eiffel Tower, is arguably the best-known green wall in Europe. The Argentinian architect Emilio Ambasz designed the striking green walled Fukuoka conference hall, with one of the largest green walls so far completed. Further It runs down the entire south sloping building face, doubling the size of the existing park. Different terraced floors of the green wall provide areas for meditation, relaxation and near its ground level, a series of terraced water pools. Individual walls can, of course, also get the vertical garden treatment. This is the entrance wall to a company HQ in Derby. 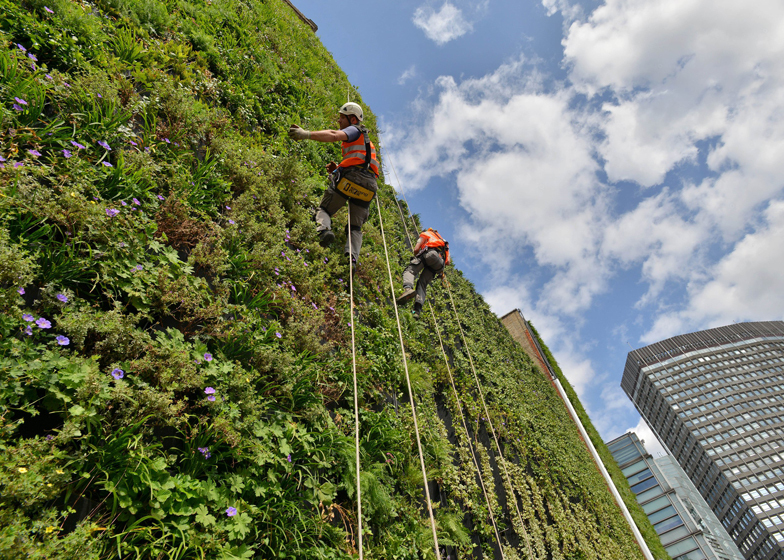 Rubens Hotel, Victoria – The UK’s largest vertical garden (68 feet tall) consists of 10 000 different plants, including 20 plus seasonal plants, soaking up over 10 000 litres of water, helping to reduce the amount of rainwater which gets to the ground. 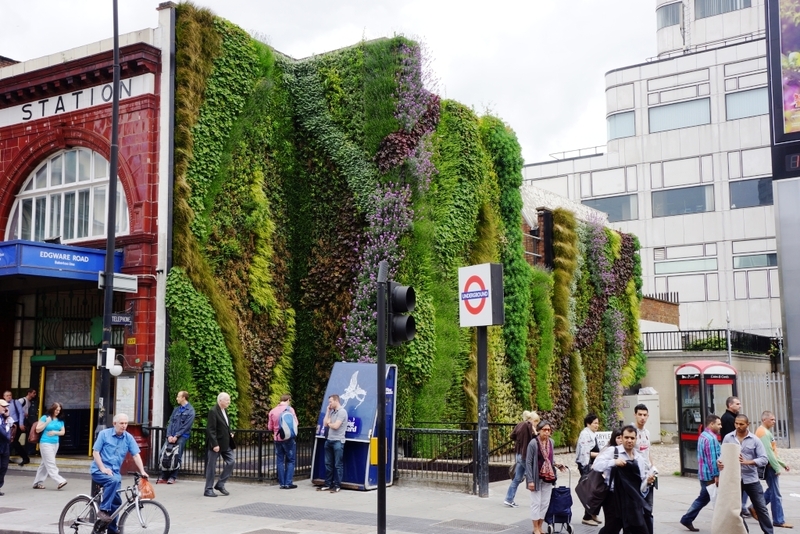 This Transport for London station project shows how vertical gardens can work well with older Victorian fabric, and makes the link between transport and greening the city, less pollution and better air quality.